During Q2, performance leadership shifted back toward U.S. investments as markets remained volatile amid escalating trade conflicts and slowing international growth. Diversification continued to add value as asset classes such as real estate investment trusts (REITs) and small-cap stocks bounced back to the top of the charts. Diversification within bonds also benefited investors as high-yield bonds and Treasury Inflation-Protected Securities (TIPS) delivered positive returns. 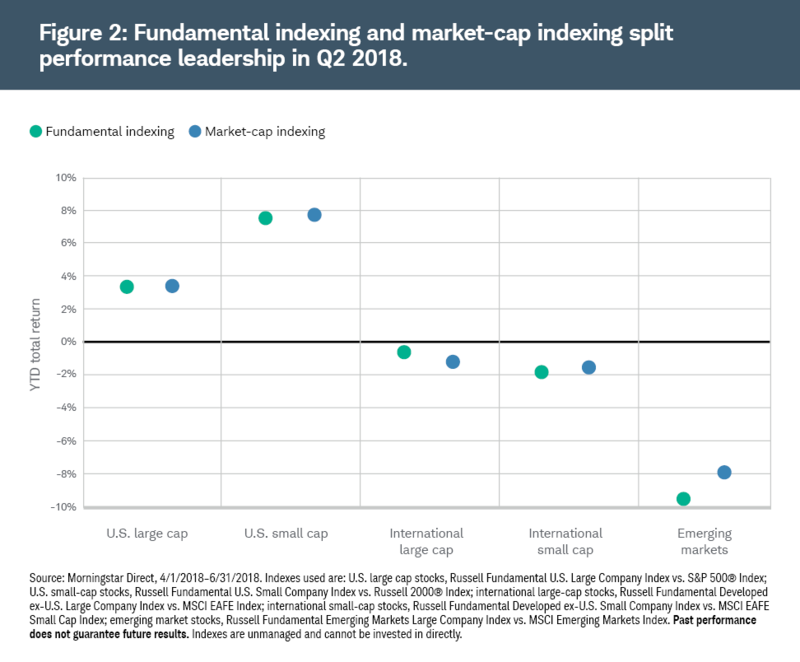 Fundamental indexing and market-cap indexing again split performance leadership, illustrating why Schwab Intelligent Portfolios includes both forms of indexing for diversification. As financial markets remained volatile, portfolio returns across the risk spectrum were relatively flat, ending generally up or down a few basis points for the quarter. How did financial markets do in Q2 2018? Financial markets remained volatile through the second quarter of 2018 following the market correction during the first quarter. U.S. investments reassumed leadership during the quarter after international investments led in 2017, illustrating the benefits of diversification across geographies. The S&P 500® Index of large-cap stocks moved up and down within a relatively narrow trading range, ending up 3.4% for the quarter. The Russell 2000® Index of U.S. small-cap stocks did better, with a return of 7.8%, and were among the top performers, benefiting from their greater domestic focus amid escalating trade friction. International investments came under pressure as concerns about trade combined with slower overseas economic growth and the additional headwind of a stronger U.S. dollar. U.S. real estate investment trusts (REITs) were a top performer for the quarter, bouncing back from their bottom position of the first quarter. This rapid shift further underscores the benefits of broad diversification across asset classes, which can move rapidly from top to bottom performers and vice versa. Spreading investments across multiple asset classes can help ensure that your portfolio holds some of the top performers at any given time while not being overly concentrated in the bottom performers. The benefits of diversification were also evident within bonds during the quarter. Fixed income asset classes such as high-yield bonds and Treasury Inflation Protected Securities (TIPS) delivered positive returns, while core bond asset classes such as Treasuries and investment-grade corporate bonds declined. During the quarter, the Fed raised short-term interest rates another quarter percentage point, while longer-term rates held steady. This has caused the difference between short- and long-term rates to narrow over the past few quarters, a phenomenon known as a "flattening yield curve." This flattening has led to concerns that the yield curve might invert in coming quarters, with short rates higher than long rates, which has historically preceded recessions. For now, however, the yield curve remains upward sloping, U.S. economic growth and corporate earnings remain strong, and a recession does not appear to be looming on the near-term horizon. Source: Morningstar Direct, as of June 30, 2018. Performance figures shown are total returns for each asset class during the designated period. Indexes used are U.S. real estate investment trusts, S&P United States REIT Index; U.S. small-cap stocks, Russell 2000® Index; U.S. large-cap stocks, S&P 500® Index; high-yield bonds, Bloomberg Barclays High Yield Very Liquid Index; Treasury Inflation Protected Securities, Bloomberg Barclays U.S. Treasury Inflation Protected Securities Index; international bonds, Bloomberg Barclays Global Aggregate ex-USD (Hedged) Bond Index; U.S. Treasuries, Bloomberg Barclays U.S. Treasury 3-7 Year Bond Index; investment-grade corporate bonds, Bloomberg Barclays U.S. Corporate Investment Grade Index; international developed-market large-cap stocks, MSCI EAFE Index; international small-cap stocks, MSCI EAFE Small Cap Index; gold and other precious metals, S&P GSCI Precious Metals Index; emerging market stocks, MSCI Emerging Markets Index; emerging market debt, Bloomberg Barclays Emerging Markets Local Currency Government Bond Index. Past performance does not guarantee future results. Indexes are unmanaged and cannot be invested in directly. Performance leadership was split between market cap and fundamental indexing during Q2.2 While the market environment in which growth investing has outpaced value investing in recent quarters has tended to favor market-cap indexing, fundamental indexing gained ground during Q2. Fundamental indexing was in line with or slightly led market cap in both U.S. and international large cap, while the opposite was the case in small cap. These shifts in performance leadership illustrate how a combination of both fundamental and market-cap indexing in a portfolio can help provide additional diversification. Each of these forms of index investing tends to lead in different market environments, so including both within a portfolio can enhance diversification while retaining the benefits of indexing—such as low costs, transparency and tax efficiency. How did Schwab Intelligent Portfolios® do? The second quarter of 2018 was another challenging period for the markets. While not as volatile as the first quarter, markets continued to swing higher and lower. Diversification helped to moderate the ups and downs, and portfolio returns across the risk spectrum were relatively flat for the quarter, ending generally up or down a few basis points. During the quarter, Charles Schwab Investment Advisory, Inc. (CSIA) implemented its annual asset allocation and ETF review for Schwab Intelligent Portfolios. Allocations were adjusted based on the annual update of CSIA’s long-term return and risk expectations for each asset class, and several new ETFs were selected because they are more representative of their asset class or have lower expense ratios than the previously assigned ETFs. Knowing which type of portfolio is most appropriate for you is a matter of understanding your goals and risk tolerance. Schwab Intelligent Portfolios is designed to recommend a portfolio consistent with your objectives, time horizon and ability and willingness to take risk. Whether you’re invested in a more conservative or more aggressive portfolio is based on your answers to our online investor profile questionnaire. We recommend that you revisit the questionnaire at least annually to ensure that your portfolio continues to be suitable based on your current goal, time horizon and risk tolerance. Moving forward into the third quarter, risks have risen as global economic growth has become less synchronized, trade frictions have escalated, and the Treasury yield curve has flattened. However, U.S. economic growth and corporate earnings remain strong, even as international growth has slowed. While the yield curve has flattened, it remains upward sloping, and conditions do not appear to be portending an imminent recession. Markets may continue to climb this "wall of worry," but volatility will likely remain elevated in coming quarters. Following the exceptionally calm market environment of 2017, the increase in volatility so far in 2018 was not a surprise in this later stage of the economic cycle. It’s important to remember, however, that financial markets are volatile by nature—and that portfolio rebalancing is important to maintain your intended level of risk. Investing in a diversified portfolio consistent with your goals and risk tolerance, and maintaining the discipline to stick with your longer-term financial plan through these periods of turbulence are among the keys to long-term investment success. With up to 20 asset classes in any single portfolio, and automated rebalancing, tax-loss harvesting and goal tracking, Schwab Intelligent Portfolios is designed to recommend a diversified portfolio consistent with your risk profile and manage your portfolio with discipline to help keep you on track toward reaching your financial goals. David Koenig CFA®, FRM®, is Vice President and Chief Investment Strategist for Schwab Intelligent Portfolios. 1. This quarterly commentary is designed to provide you with insight into the market environment during the quarter. How your portfolio performed is dependent upon your asset allocation across the risk spectrum, from conservative to aggressive, as well as criteria such as when you opened your account, the timing of any deposits/withdrawals, timing of portfolio rebalances, whether you are enrolled in tax-loss harvesting and other criteria. Tax-loss harvesting is available for clients with invested assets of $50,000 or more in their Schwab Intelligent Portfolios account. Clients must enroll to receive this service. There is no guarantee the intended goal, or the duration of future withdrawals associated with those goals, will be reached. Please refer to the Schwab Intelligent Portfolios Disclosure Brochure for additional information. Schwab Intelligent Portfolios® is made available through Charles Schwab & Co., Inc. ("Schwab"), a dually registered investment advisor and broker-dealer. Portfolio management for the Schwab Intelligent Portfolios is provided by Charles Schwab Investment Advisory, Inc. ("CSIA"), a registered investment adviser and an affiliate of Schwab. Both CSIA and Schwab are separate entities and subsidiaries of The Charles Schwab Corporation.